Thrilling, gospel-driven adventure videos featuring Willie Aames (Eight is Enough and Charles in Charles) as Miles Peterson, alias action-hero Bibleman. This hugely popular series combines action packed stories with Bible verses and lessons to help real kids deal with real problems. Whether he's fighting against rage, fear, disobedience, or pride, Bibleman uses the strength of God and the power of His Word to overcome evil. On DVD and video! 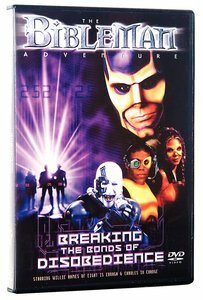 About "Bibleman: Breaking the Bonds of Disobedience"